The two biggest challenges in 2018 will continue to be protecting against unauthorized access, and patching/updating the software of the device. Companies must not neglect the security problems of IoT and IIoT devices. Cyberattacks on the Internet of Things (IoT) are already a reality. According to Gartner‘s market researchers, global spending on IoT security will increase to $1.5 billion this year. Britain’s Huawei oversight board has said the Chinese company is a threat to British national security after all – and some existing mobile network equipment will have to be ripped out and replaced to get rid of said threat. “The work of HCSEC [Huawei Cyber Security Evaluation Centre]… reveals serious and systematic defects in Huawei’s software engineering and cyber security competence,” said the HCSEC oversight board in its annual report, published this morning. The fact that a cyber attack can have physical consequences is not exactly breaking news. The use of the computer worm Stuxnet to destroy nearly a thousand, or about a fifth, of the centrifuges in Iran’s Natanz nuclear enrichment facility is now a decade in the rearview. This updated iteration of Bashlite is notable. For one, its arrival method is unique in that it doesn’t rely on specific vulnerabilities (e.g., security flaws assigned with CVEs). It instead abuses a publicly available remote-code-execution (RCE) Metasploit module. A German security researcher has printed the word “PWNED!” on the tracking maps of hundreds of GPS watches after the watch vendor ignored vulnerability reports for more than a year, leaving thousands of GPS-tracking watches –some of which are used by children and the elderly– open to attackers. Speaking at the Troopers 2019 security conference that was held in Heidelberg, Germany, at the end of March, security researcher Christopher Bleckmann-Dreher presented a series of vulnerabilities impacting over 20 models of GPS watches manufactured by Austrian company Vidimensio. Back in December 2017, Dreher discovered flaws in the mechanism through which the GPS watches communicate with this backend API server. For example, of a total of 150,000 machines used in manufacturing environments, nearly 5% had been running Windows XP, compared to less than 3% in other industries. These methods are a significant departure from the traditional way of securing devices through limiting access, which has been the accepted method for securing everything from a bank vault to a server or a chip. But as more devices are connected to the Internet, and as more electronics are added into those devices, limiting access can be counterproductive and/or ineffective. Either way, such theft is preventable, Prestridge told us. Using a security development environment called Embedded Trust, engineers can employ a certificate builder that lets them control limits on manufacturing, thus enabling product developers to protect IP. Small Internet of Things (IoT) devices running a Windows IoT operating system (OS) are vulnerable to a flaw that could allow an attacker to seize full operational control. Microsoft’s Windows 10 IoT Core OS is designed to run on smaller smart devices like the Raspberry Pi used by hobbyist computer programmers and tinkerers. But a flaw with its Sirep/WPCon communications protocol can allow a malicious actor to take over the device. March 12, 2019 – The weakest link of a healthcare IT network is IoT devices, cloud, and mobile, including ultrasound machines, due to legacy operating systems and open source systems, according to a new report from Check Point Research. The researchers found that in many scenarios these devices are easy to hack into, putting the massive storage of patient data at risk. Specifically, the researchers noted three major vulnerability issues with IoT devices. Check Point found the open source nature of IoT devices leave them vulnerable to cyberattack, while increased data collection and storage makes the devices a prime target for hackers. Lastly, the researchers noted that often IoT devices can serve as an entry point for cybercriminals, who then leverage the access to move laterally across the network to gain access to more data. “Alternatively, the device could be attacked directly and shut down with a highly disruptive effective,” the researchers wrote. For example, Check Point researchers discovered an ultrasound machine that operated on the Windows 2000 platform and no longer received patches from Microsoft, which left the machine vulnerable to attack. IoT security is an extremely hot topic right now. I recently was asked by a friend (a VC partner) to talk with a very early stage startup offering a new angle for protecting IoT devices. As part of my preparation for the call, I spoke to a few friends in the field and some customers. It seemed this market became crowded very fast with many startups, each working hard to find the best way to differentiate itself. And many customers just confused. I than decide this is a good topic for “IoT security a short review and what I noticed” post. Internet of Things (IoT) security is the latest addition to the cybersecurity world. As more and more devices are being connected to the internet, and especially after large-scale attacks have occurred, it is clear that security should consider and integrated with IoT deployments. 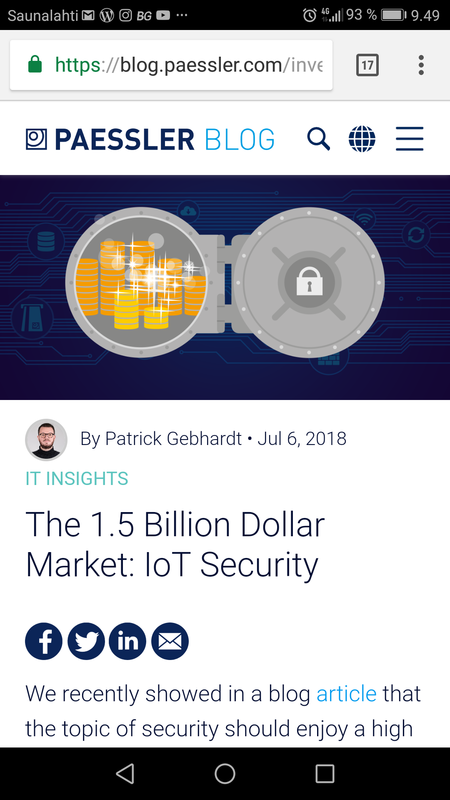 Gartner Says Worldwide IoT Security Spending Will Reach $1.9 Billion in 2019, and will raise to $ 3.1 billion in 2021, making it one of the fastest growing segments in cybersecurity industry. But, as they say on Facebook, It’s complicated. IoT (like the cloud, and mobile before it) challenges are established perceptions about IT architecture and subsequently its security. At first, there were mainframes, then desktops and laptops, and finally mobile devices came along. These are all, in reality, computers (of different sizes and capabilities), with a processor, operating system, some user interface and some sort of connectivity. IoT, however, is comprised of every Internet-connected device that is not mentioned above, including smart home appliances, water meters, security cameras, smart-city devices and many more. These devices are miniature computers running on Linux devices, with some computing power and the ability to communicate via web protocol (i.e., they have an IP address). Smaller, less sophisticated connected devices are also part of the IoT landscape. These often function as sensors, are equipped only with short-range communication capabilities and are deployed in a mesh configuration, meaning that they communicate with the Internet using an IoT gateway, which is an industrial modem with some compute power. Some are connected directly to the cloud with a cellular modem. One could argue that connected vehicles are also IoT devices, and so are planes and ships and any connected device (Although they are connected, they have dedicated security solutions and therefore fall under their own category) for the sake of simplification, I will focus on “Classic” IoT devices. Which Verticals Does IoT include? Smart cities: lighting, parking, traffic, surveillance, air quality sensors (ShieldIoT, Cybeats). Device hardening/chip security: These aim to harden the connected device itself and make it less prone to hacking. These solutions focus on the chip level or the SIM. Encryption and authentication: The most common security solutions available today, these aim to ensure that only recognized devices can access the network and that the data they collect (and sometimes store) is secured. Discovery: These solutions are aimed at enterprises that want to secure themselves from IoT-borne threats. As such, they utilize several types of receivers to intercept different IoT protocols (Zigbee, Bluetooth, and Wi-Fi), discover unknown IoT devices connected to corporate networks, and keep an inventory of these devices. More specialized solutions are also available. Some companies offer specific solutions for specific verticals, such as stadiums for medical devices/ hospital networks. IIoT (Industrial IoT): These solutions are extensions of ICS cybersecurity solutions, aiming to secure industrial (OT) networks from external cyber threats. IoT Platforms: Since most IoT deployments are managed on specific IoT-cloud platforms, it makes sense that these platforms will also provide security features. Recently, Cloud Provider Microsoft Azure Rolls Out Security Center for IoT. It is interesting to see whether these platforms will integrate external solutions (similar to the process that has happened with cloud providers and security vendors). IoT Devices Security Management: This is the category aimed at securing “classic” IoT deployments, including large quantities of devices deployed in cities and homes. These solutions focus on securing the actual devices and identifying malware infections that can lead to large-scale botnet attacks like Mirai, which infamously infected and recruited thousands of devices to launch the world’s largest DDoS attack. IDSM can be delivered as a managed service to match the business model of its users, the IoT service providers. One such vendor is Cybeats.